It’s like taking money and throwing it down the drain. When you’re paying for Facebook ads to get leads for your business, but your landing page doesn’t convert those visitors into leads, you are throwing money away. A high converting landing page will make sure that all those people that click on your ad to learn more or sign up actually does that and give you their email address in exchange for whatever you’re promising in your ad. It’s your landing page that’s going to make people go, “I want more of what this chick’s got,” or “I’m confused. I’m just going to click back and go back to scrolling through my news feed.” When they do that, I think it’s just tragic. 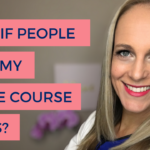 Hi, I’m Salome Schillack, and I help coaches and consultants become wildly popular and get leads into their businesses using Facebook Video and Facebook Video Ads. Today we’re going to look at the five elements that make up a high-converting landing page. 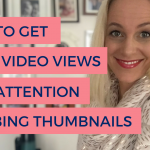 I’m going to show you how you can optimise your landing pages so that everyone who clicks the button on your ad, ends up becoming an email list on your list. And I’m going to show you a few examples of great landing pages that I found on Facebook this morning. The first element of a high-converting landing page is your attention grabbing headline. A good headline is clear and concise and communicates exactly what you’ll be getting when you opt in. It also focuses on the benefits you receive when you opt in, so it doesn’t just say what you get, but it helps you to understand why you really want it. Be careful not to be clever or tricky in your copy in your headline. You want it clear. You want it concise. You want it to the point, and a three-year-old must be able to understand what exactly you’re offering. Next up, we’re going to look at images on your landing page. The images on your page serve to support the copy and helps create a positive visual experience for the viewer. A good image is related to what it is they’re getting when they opt in, and it doesn’t confuse or distract them. Something else to consider when you’re choosing the images for your landing page is how does it match up to the image you had in your Facebook ad? If you can create consistent visual branding throughout the ad and the landing page, that gives people more of a sense of security, and they feel safer, and they trust you more. The third element of a high-converting landing page is the copy. When you’re writing copy for your landing page, remember the golden rule of less is more. The fewer words you can use in your copy, the better. When we use too many words, we run the risk of confusing our audience, and then they’re just going to click away. Be clear, be concise, tell them exactly what they’re getting, and why it matters to them, and then be done. The fourth element of a high-converting landing page is the call to action button. The call to action button is that bossy button that tells us exactly what we need to do. 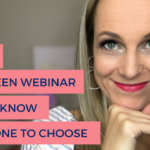 As humans, we are all by nature procrastinators and fence sitters, so you need to be bossy in your call to action button, and tell people exactly what you want them to do. The copy on your call to action button should sound exactly like something you’ll never say to your mom, “Shop now, sign up, click here.” Be very clear with the copy on your call to action button, and tell people exactly what you want them to do. Also, make sure your button really pops by making it a contrasting colour to the colour on the background or in the majority of your sales page. Finally, the last piece of a high-converting landing page is a good lead capture form. The rule of thumb for a good lead capture form is the less information you ask for, the more likely people are to give that to you. Just asking for a first name and an email address is more likely to get you opt-ins than when you’re asking for a whole lot of information that they’re just not ready to hand over to you. Let’s have a look at a few landing pages that I’m willing to bet my bottom dollar is converting really well. The first landing page comes to us from the guys at Screw the Nine to Five. If you don’t know who they are yet, search for Screw the Nine to Five in Facebook, and join their group. This landing page is for a freebie that they’re giving away to help you get better engagement in your Facebook group. The headline is clear and tells you exactly what you’re getting. That little bit where Jill says, “Turn your lurkers into lifers,” is such an awesome benefit statement. I’m sure every Facebook group owner can relate to the frustration of having tonnes of lurkers in their group and really trying to turn those lurkers into lifers. The image perfectly supports the clean messages on the page, and the call to action button stands out in turquoise and tells us exactly what to do to get your free PDF. The second landing page we’re going to look at is a bit of a wildcard, and it’s a wildcard because it’s a landing page for an application to a one-on-one strategy session. We don’t see a lot of Facebook ads for one-on-one strategy sessions, and the reason for this is there are about 100 ways to do it wrong and only a couple of ways to do it right. But on this landing page, I believe this guy is doing it right, so I wanted to show you. Jason Hornung has a Facebook Ads agency, and he’s inviting business owners to apply for a strategy session. The headline is very clear and focuses on the benefit of not having to do your ads yourself anymore. And anyone who’s had the frustration of doing their ads themselves will relate to this immediately. He included a short video that instantly connects with his audience, and his call to action button stands out in yellow while telling us exactly what we should do. I love the fact that he includes an application process, a questionnaire, a kind of a filter before they deserve to get time with him. That’s a great strategy. Finally, let’s look a landing page from the guys at Digital Marketer. Who doesn’t want to double their sales? What I love so much about this headline is that they already pre-suppose that we’re going to opt in by saying, “You’re about to discover it for free.” Psychologically, this draws the reader in and creates a curiosity, which I’m sure pays off handsomely for Digital Marketer’s lead generation. The images support the message without being distracting, and the call to action button is clear and tells us exactly what to do. There you have it, folks. Now you know what the five elements are of a high-converting landing page, and you’ve seen how three pros do it well. 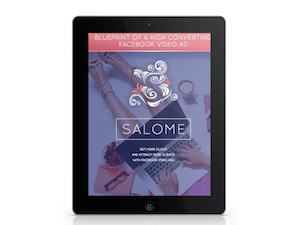 The next time you’re running Facebook ads for leads, webinars, or one-on-one strategy sessions, you now know exactly how to create a landing page that’s going to convert like crazy and turn all those dollars you’re giving Facebook into leads in your business. Tell me in the comments below what is one thing that you can improve on your landing pages right now. If you like this video, give it a like, and if you think someone else will like it, please share it with them, too. Have a Facebook fabulous week, and I’ll see you next week.